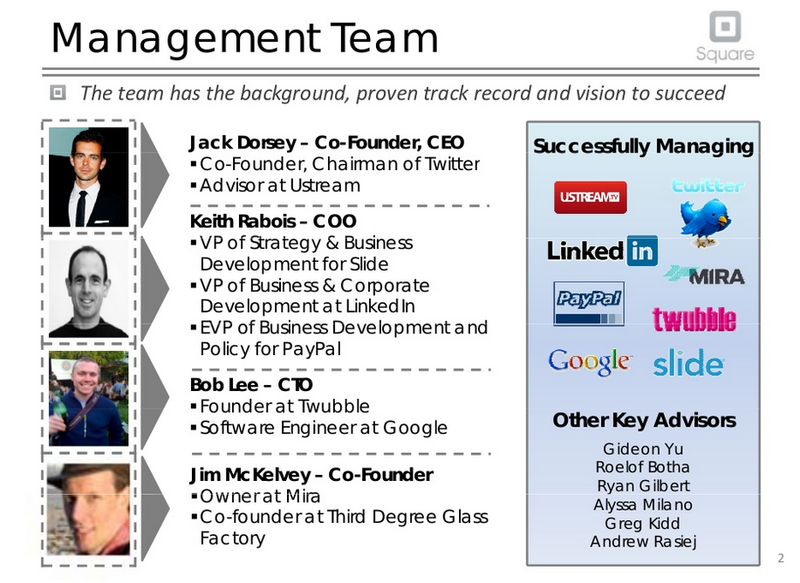 Team slide is often the most overlooked slide in most pitch presentations. Most of the time it looks like a short bio of the founders and nothing else. This needs to change. To write this post, I have drawn upon the knowledge of scores of experts and VCs. I have seen startup decks and read a lot of books and online material. What does the investor want from the Team slide? It does not matter what you want to say. What matters is what the investor wants to hear. So what does the investor want to hear about your startup team? What is he concerned about? Does your team have domain expertise? If you are selling software for doctors, what do you know about doctors and about software? Does the team have the skills to run the business and minimize the risks? Does the team have experience of running a business (especially experience of working in a startup)? Will this team be able to work and stay together? Is there chemistry between the key members? Let us take an example. Suppose you are in the business of selling real estate online. As an investor I need to invest $1 million dollars in your business. What will I ask myself? I would want to find out answers to the above 4 questions. On the team slide, whatever you put has to be targeted at these questions. Domain expertise - Has any member in your core team worked in the real estate industry before. If someone has, that's a huge plus. If there are none, do you wish to hire someone (once you get funding)? Or do you have advisors on board, who will supply the much needed domain knowledge. Then name the advisors and what they bring to the table. Skill sets - Running a business needs multiple skills. Technology, sales and marketing and operations. Does your team have all the skills it needs? Who will head technology and why is he suited for the job. Tell me that. Who will ensure that customer acquisition is taken care of. Who will work on operations. Experience - Has anyone in the core team worked in a startup before? Startups are very different from normal businesses and need a different mindset. If the founder is a serial entrepreneur, that's the thing you need to communicate first. Chemistry - Has the team worked together before? Will it stay together when the going gets tough. If both the co-founders were in the same team for 5 years in their previous jobs, that takes care of this concern. Your attempt is to address all the concerns of the investor in as less words as possible. You will only write stuff on the slide so that you address these concerns. Who all are part of the team? Your existing team might not have all the skills and you want to hire a good talent. Talk about that. You need not have the perfect team in place before going for funding. Do you talk about all these people in detail? The answer is no. It all depends on what they bring to the table. It all depends on how we are able to answer the 4 questions. What to write about the team? I met an investor a month back who looks at hundreds of decks (presentations) every year. He said, "Degrees matter less to us. Tell me why will this member do a good job in this company?" Remember your job is to tell the investor your team has the domain expertise, skills, work experience and the required chemistry. Key achievements from past jobs (increased revenues in company X, developed some product or have successful exits or IPO). Write one sentence about each of them that addresses the four key concerns. Who brings the domain expertise, who brings in startup experience, who has relevant work experience and do you have chemistry. The key word here is relevance. For each member, pick something from his / her past which is relevant to your startup. Just throwing names will not help. I like this example from Guy Kawasaki's book 'The Art of the Start'. If your slide says Ms. Mary is on our board of advisors, that says nothing to the investor. Ask yourself 'so what?'. Ms. Mary is blah blah blah and we are doing so well as a company that we are attracting such talented people. Then follow it up by saying 'for instance' she has already opened many doors for us in the industry. That is relevant and useful for the investor. Here are few team slides from publicly available decks. I have put these up for discussion. These are by no means ideal in all respects. This one is from buffer. 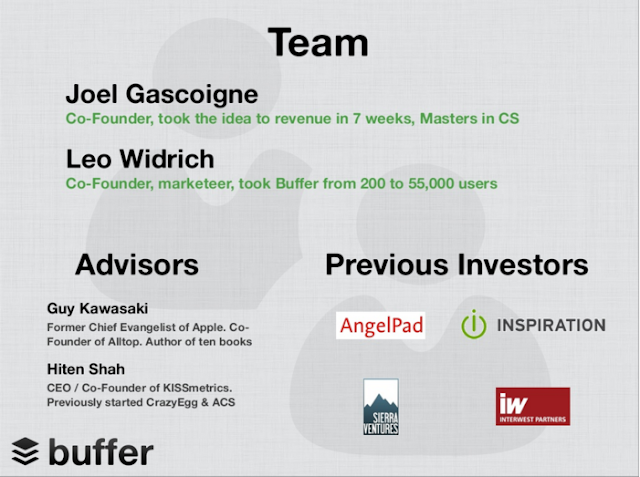 A startup which raised $500,000 using this slide deck. Let us see how they have addressed investor concerns. Joel took the idea to revenue in 7 weeks. That's a significant achievement. He has a Masters in CS. He's the tech guy. Leo is the marketer and his achievements are mentioned. Have they worked together before? We will never know. Many things are said but never written on a slide. Look at the advisors list and you see big names there; Guy Kawasaki. That says a lot about the potential of this startup. After all Guy is backing this. 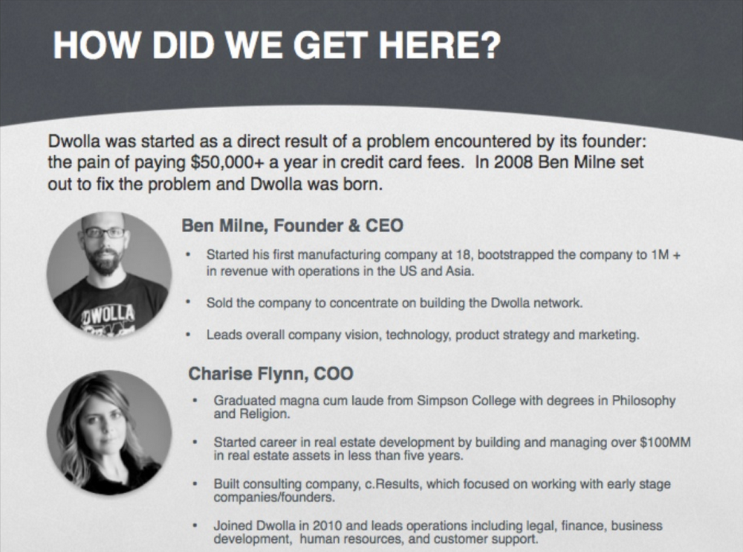 Here is a slide from Dwolla's slide deck which they used to raise $16.5 million. Ben is a successful entrepreneur who built his first company at age 18. Took it to 1 million+ revenues and sold it as well. He handles technology, product strategy and marketing. Charise has had good experience. She heads operations, finance etc. and she has spent 3 years in the company (working with Ben). She joined in 2010 and the date of the presentation is 2013. Looks like too many roles for each person. That's why at the end (of the deck) they mention key hiring plans for 2013: product, BD, marketing, etc. The positive is the focus on Ben as a successful entrepreneur. However, Charise's background gets into too much detail. Here is another pitch deck from square. This is visually a bad slide. But then this post is not about design. Look at the content more carefully. Each member has startup experience. CEO co-founded Twitter. COO has worked in LinkedIn and PayPal. CTO was a software engineer at Google and so on. When you make your team slide, spend some more time and think what is there about each member that is remarkable. That makes that member valuable to the startup. Share that. I have found these articles very useful while doing my research. Check these out: Mukund Mohan Mark Suster Stewart Masters (see point 8) and Nicole Gravagna. Check out more articles on investor funding.